The volume and frequency (pitch) of the beeps can be adjusted on the sound system or MMI. 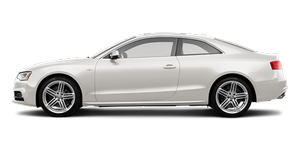 – Select: Function selector button CAR> Audi parking system. • Rear volume - to adjust the rear volume. • Rear frequency - to adjust the rear frequency. • Front volume - to adjust the front volume. When you change the volume or frequency, the front or rear loudspeaker will give a test warning beep at the new setting for about 2 seconds. The volume and frequency settings will be automatically stored and assigned to the remote control key.